A blog for biblical studies in the palm of your hand. John Jackson's Parsed Interlinear Odyssey! Now you can read the Muse's story in fully parsed Greek on your PalmOS handheld! John Jackson, of handheldclassics.com, has released a parsed interlinear Greek text of Homer's Odyssey for use with PalmBible+. John has put a tremendous amount of work into this text, including providing line numbers for the English translation, so that it scrolls in sync with the Greek text! The text, along with other Homeric works are available for download at text.handheldclassics.com. The translation and text are based on the public domain Loeb edition: Homer. The Odyssey with an English Translation by A.T. Murray, PH.D. in two volumes. LCL 104 & 105. Cambridge, MA., Harvard University Press; London, William Heinemann, Ltd. 1919. As of now the default verse chooser in PalmBible+ only goes up to verse 219. This means that several of Philo's and Josephus' works (which have more than 219 sections) are difficult to navigate. The verses are there, but one must scroll to them. (Many thanks to Jérôme Moreau for pointing this out.) I've posted a message to the PalmBible+ forum. Hopefully the default verse chooser can be fixed for future use. In the meantime, you can turn on the "Old Chapter/Verse Selector" by going to Options | Preferences | Navigation in the PB+ menu, and then check the box next to "Old Chapter/Verse Selector." Available now! The Works of Philo in Greek! The Works of Philo in Greek are now available for non-commercial use with PalmBible+, thanks to the kind permission of Kåre Fuglseth and the Norwegian Philo Concordance Project. To download, go to http://palmsunday.oldinthenew.org/philo-g.html, and agree to the conditions of use. Webmasters, please DO NOT host the Philo files on your own site. Only link to the conditions of use page. John Jackson of HandHeldClassics.com has produced some fantastic editions of Homer's Iliad in English and in Greek for use with PB+. He's even produced a simple web-based PB+ simulator. John has a good sense of humor as well, as shown in his his illustration to the right. 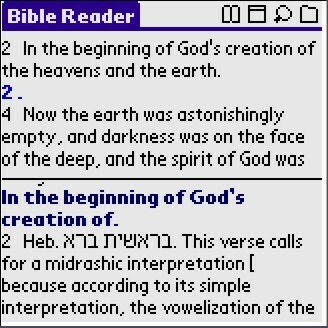 I have been extended permission by the Philo Concordance Project to convert most of their texts into PalmBible+ format. I will post more on this later. Now that the Greek text of Philo has been made available in several software platforms (Libronix, Accordance and the new BibleWorks v.7), I thought it would be great to make the Greek text available to PalmBible+ users. So, I've contacted Kåre Fuglseth of the Norwegian Philo Concordance Project, Philo of Alexandria Blog and co-editor of The Philo Index to ask for permission to distribute the Greek text (without morphology) freely. If the project grants me permission, I will make the Greek text of Philo available at this blog. See the article on the Logos Bible Software page for an appraisal of Philo's importance for biblical studies. Keep posted. A graduate of Gordon-Conwell Theological Seminary, I currently serve as the reference librarian at the seminary’s Goddard Library. I am interested in the study of the New Testament and Second Temple Judaism. In seminary I have concentrated my studies both on the Epistle of James and the use of the Old Testament in later Jewish and Christian literature. The Works of Philo in Greek and English, compiled (with permission) by Jim Darlack from the texts made available by the Norwegian Philo Concordance Project. The NET Bible for PB+ is on its way!